He was seen entering a church on Easter Sunday moments after the tweets posted. 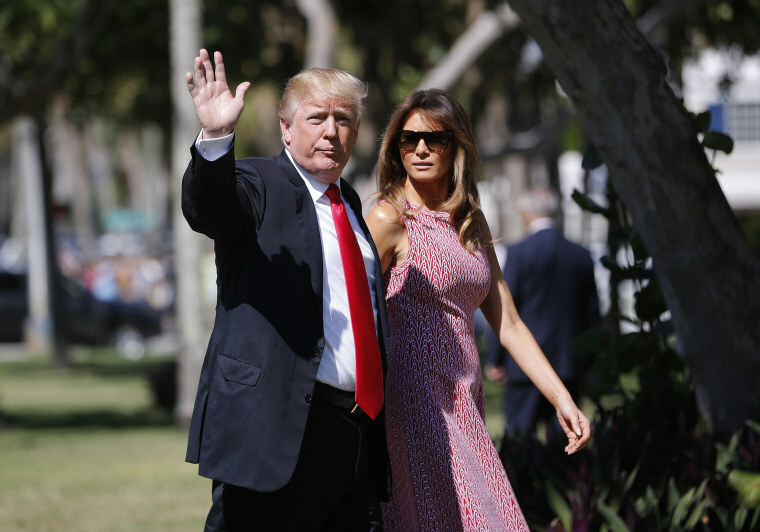 President Donald Trump loosed a series of hard-line immigration statements on Sunday after wishing his Twitter followers a "HAPPY EASTER!" He was seen entering a church moments after the tweets posted. Trump declared there would be "NO MORE DACA DEAL," referring to an Obama-era program that protected millions of immigrants who came to the United States illegally as children, and called on congressional Republicans to pass tougher immigration policies because the U.S. border with Mexico is "Getting more dangerous." In the tweets, Trump wrote that "Mexico is doing very little" to keep migrants from crossing into their country from the south or from then crossing into America. "They laugh at our dumb immigration laws," he said. The president added that "Border Patrol Agents are not allowed to properly do their job," blaming Democrats. He also claimed, without providing context, that "'Caravans' coming." "Fox and Friends" aired a segment earlier Sunday with right-wing commentator Tomi Lahren that claimed onscreen: "CARAVAN OF ILLEGAL IMMIGRANTS HEADED TO U.S."
The president went on to threaten the North American Free Trade Agreement (NAFTA) and call for a border wall. "They must stop the big drug and people flows, or I will stop their cash cow, NAFTA. NEED WALL!" he tweeted. Trump reiterated his views as he stopped to speak to reporters before entering church for Easter services. "A lot of people are coming in because they want to take advantage of DACA and we are going to have to really see," he said. "They had a great chance. The Democrats blew it. They had a great, great chance, but we'll have to take a look." "Time and time again, the president has walked away from bipartisan proposals that are exactly what he asked for," said Drew Hamill, spokesman for House Minority Leader Nancy Pelosi, D-Calif. "When an agreement to protect the Dreamers is reached, it will be despite this president rather than with his leadership." Prior to the Sunday tweets, Trump and Congress had attempted to negotiate a deal on DACA, or the Deferred Action for Childhood Arrivals program. Trump ended the program late last year but said he would protect Dreamers, as DACA recipients are known, in exchange for approval of funds to build a border wall between the U.S. and Mexico. Mexico would pay for it, he claimed on the campaign trail. "Mexico has got to help us at the border," Trump said outside church Sunday, as he stood next to his wife, Melania, and his daughter Tiffany. "If they are not going to help us at the border, it is a very sad thing. We need two countries. Mexico has got to help us at the border."